By Jonathan K. W a l d r o n a n d Susan L. Watson, Dyer Ellis & Joseph, P.C. Following the attacks of September 11. the Congress and various federal agencies quickly realized that vessels and maritime facilities are vulnerable to largescale acts of terrorism. By their very nature, ports are exposed, accessible and busy and passenger vessels carry increasingly large numbers of people. To reduce the threat of terrorism to U.S. ports and vessels operating in U.S. waters, federal personnel and equipment were immediately diverted on an ad hoc basis to security- related patrols, boardings, and other measures. It now appears that Congress will enact comprehensive port and maritime security legislation in 2002 that will include many mandates directly affecting commercial U.S. port activities and passenger vessels. As a first step in the legislative process, the U.S. Senate passed S. 1214, the Port and Maritime Security Act of 2001 (also known as the Hollings Bill) on December 20, 2001; the House has drafted its own version, which remains in committee. The U.S. Congress is not the only legislative body that is currently addressing maritime security. The International Maritime Organization (IMO) Assembly, the Organization's highest body, held its 22nd session November 19-30, 2001. At that session, the Assembly identified terrorism and maritime security as primary issues for the IMO. The Assembly adopted a resolution calling for a review of all pertinent IMO instruments with a view toward amending them to facilitate measures to prevent and react to terrorist acts. The Assembly also unanimously endorsed U.S. proposals to act vigorously to implement the resolution, and augmented the 2002 meeting schedule to enable early action on treaties and other measures designed to tighten maritime security worldwide. On January 15, 2002, the United States submitted its recommendations. In addition to legislative action, the Coast Guard is moving forward on its own initiative to develop an expanded port security policy and implement appropriate regulations. It has held maritime security meetings and workshops to receive input on issues related to port security, physical security, operational measures, and access control. Potential Impact of S. 1214 on Passenger Vessel Operations While many of the Hollings Bill's provisions specifically address port authorities and facilities, Coast Guard operations, and other government activities related to security equipment and screening measures for ports, various sections will directly affect passenger vessel operations if the bill is enacted. Provisions addressing international port security will lave the greatest impact on passenger vessels. Vessel iperators will be required to place security warnings n tickets and post warnings in their facilities if they rovide service to certain ports. Enhanced documentaon of passenger information and electronic transmison of that information will be necessary to receive earance for entry into U.S. ports. Most importantly, e United States may limit or prohibit transportation tween the United States and foreign ports with inaduate security. Specifically, the United States will notify foreign jntries of security problems with their ports and of recommended steps necessary to bring their securimeasures in line with U.S. standards. If the United States finds that a foreign port does not maintain or enforce effective security measures, it will develop measures to protect U.S. ports from risks to vessels arriving from such foreign ports, publish the identity of the port in the Federal Register, and require warnings on passenger tickets and in port facilities. The United States may also prescribe conditions of port entry for any vessel arriving from or carrying cargo that originates from or is transshipped through a foreign port with inadequate security. The United States also may prohibit any vessel from providing transportation between a U.S. port and any other foreign port that is served by other vessels navigating to or from foreign ports with inadequate security. Additionally, the United States may, without prior notice or hearing, suspend the right of any U.S. vessel or person to enter from or depart to a foreign port in which a condition exists that threatens the safety or security of passengers, vessels, or crew, or may suspend trade between the United States and that port. Finally, an annual report must be submitted to Congress listing all nations whose flag vessels have entered U. S. ports in the previous year, with a breakdown of countries addressing issues that potentially affect U.S.
security such as port state control matters, fraudulent information presented by ships, and inadequate vessel regulations and classification procedures. The Hollings Bill requires passenger vessels to document and electronically transmit certain passenger information in advance of entry or clearance into a U.S. port. It also authorizes the United States to require any other pre-arrival message deemed necessary to ensure the safety and security of U.S. ports and waterways. The Coast Guard currently requires much of this information to be transmitted 96 hours prior to arrival at a U.S. port. Moreover, passenger vessels will be subject to boardings, searches and seizures by Maritime Safety and Security Teams under the Hollings Bill. The bill authorizes the Coast Guard to dispatch trained and qualified armed Coast Guard personnel — Sea Marshals- aboard vessels to deter, prevent, or respond to acts of terrorism or otherwise provide for the safety and security of the port and maritime environment. The legislation also authorizes the United States to require owners and operators of a vessel to provide an appropriate level of security, including armed security. It appears that vessels will not be financially responsible for Sea Marshals. However, owners and operators ultimately may have to provide on-board security personnel. resulting in additional costs to the industry. The Hollings Bill establishes requirements tor vessel security plans and programs for vessels calling on U.S.
ports. There is no indication as to how such security plans would differ, if at all, from those currently required of passenger vessels. Finally, crewmembers aboard vessels calling on a U.S. port would be required to carry and present upon demand such identification as the Secretary determines necessary. 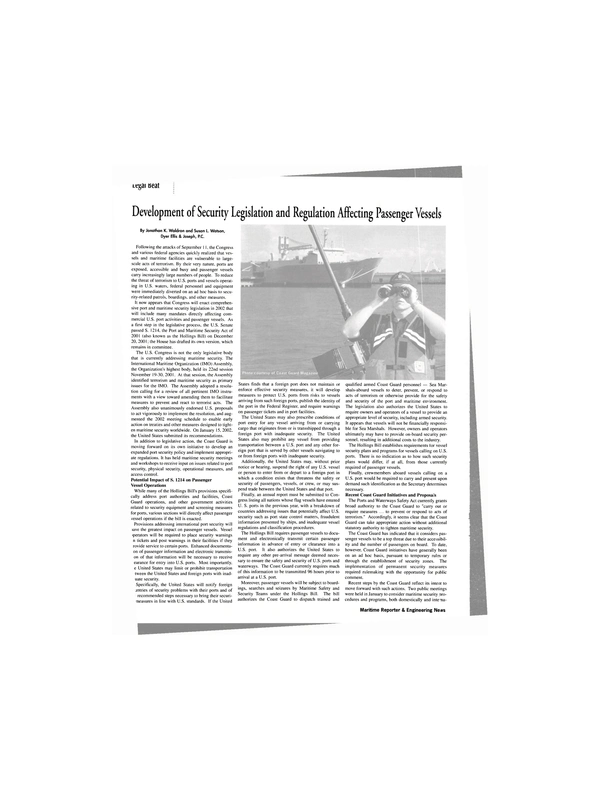 Recent Coast Guard Initiatives and Proposals The Ports and Waterways Safety Act currently grants broad authority to the Coast Guard to "carry out or require measures ... to prevent or respond to acts of terrorism." Accordingly, it seems clear that the Coast Guard can take appropriate action without additional statutory authority to tighten maritime security. The Coast Guard has indicated that it considers passenger vessels to be a top threat due to their accessibility and the number of passengers on board. To date, however. Coast Guard initiatives have generally been on an ad hoc basis, pursuant to temporary rules or through the establishment of security zones. The implementation of permanent security measures required rulemaking with the opportunity for public comment. Recent steps by the Coast Guard reflect its intent to move forward with such actions. Two public meetings were held in January to consider maritime security orocedures and programs, both domestically and intema- tionally. As a result of one of those meetings, the Coast Guard identified several security control measures including Automatic Identification Systems (AIS) for ships; security plans for vessels, port facilities and offshore units; systems for seafarer identification, verification and background investigations; and ship and company security officers. Regardless of whether the Hollings Bill or other legislation is enacted, the Coast Guard can-and will-move forward. In addition, the Coast Guard is working closely with the Department of Justice to use enhanced security inspections as opportunities to scrutinize compliance with an array of other regulatory requirements. IMO Action Plan to Address Maritime Security During 2002 Pursuant to the resolution passed by the IMO Assembly in November 2001, various IMO bodies will include terrorism and security measures on their 2002 agendas. The Facilitation Committee, Sub-committee on Standards of Training and Watchkeeping, the Intersessional Working Group on Maritime Security, Maritime Safety Committee, Legal Committee, and IMO Council will all convene during the year and will address maritime security issues. Of note, at its February meeting, the Intersessional Working Group (WG) will conduct a review of existing safety instruments crucial in determining the course IMO should follow to address terrorism issues. Proposals to amend SOLAS will be the main focus of the WG's efforts, and they have asked governments to suggest actions that would further the purposes of the Assembly resolution. The Legal Committee, during its meeting on April 22-26. will review the Convention for the Suppression of Unlawful Acts Against the Safety of Maritime Navigation (SUA), 1988, and its companion protocol on offshore platforms (the SUA conventions) with a view toward revising them to address terrorism more effectively. Member States are obligated to comply with and enforce any resolutions, treaty amendments, or new free-stranding treaties adopted by the IMO. Given the United States' leading role in the push for global maritime security action, it is likely that many U.S. domestic policies will be reflected in new IMO measures. If so, passenger vessels may well be subject to similar requirements found in the Hollings Bill and Coast Guard policy development. Conclusions and Recommendations Port and maritime security legislationboth domestic and international-and the development of Coast Guard measures will, in large part, be shaped by public and private sector input. Those connected to the marine industry should follow developments both in Congress and at the IMO, and should participate in Coast Guard workshops and meetings. Be aware that the U.S. Coast Guard is the lead federal agency for IMO matters, and that opportunities will occur from time to time to provide advice and recommendations to Coast Guard officials regarding domestic measures as well as the U.S. positions to be taken at IMO. Trade associations are often useful in keeping up to date on developments and for general input to the Coast Guard consultation process. U.S. and IMO decisions on maritime security will impose necessary but burdensome requirements on the marine industry for decades to come. Company personnel should be given enhanced training and advice on how to cope in this new environment. Jonathan K. Waldron is a partner with Dyer Ellis & Joseph, P.C., a Washington, D.C. -based law firm. Susan L. Watson is an associate with the firm.